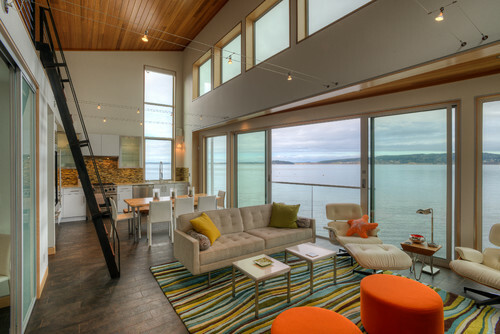 The story of how a modest cabin perched on the edge of Puget Sound on Camano Island, Washington, became a sturdy modernist structure strong enough to take on no less than a tsunami is an interesting one. 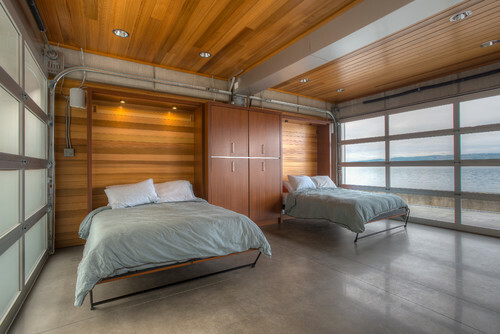 The owners contacted Dan Nelson, principal at Designs Northwest in Seattle, about a simple remodel for their small, classic fishing cabin. Plans were drawn and permits were issued. But the clients didn’t pick them up from the building department for more than a year. When they finally got around to it, they found that their permits had expired and the government had changed things. Nelson says. Nelson says the news came as a shock to the homeowners — and to him — but they were able to turn the curveball into a positive design situation. The new requirements necessitated looking at the project in a different way, and the result is a stylish home that’s built for a storm. 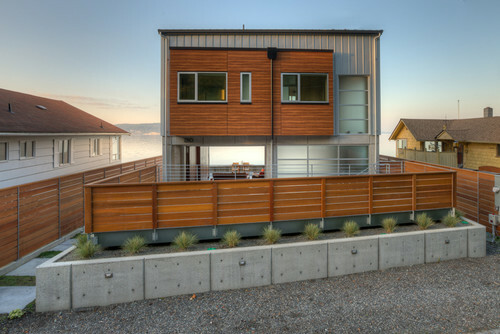 That idea led to the creation of what the architects dubbed the Tsunami House. The main living space is on the second story; the lower level is what the family calls the cabana. 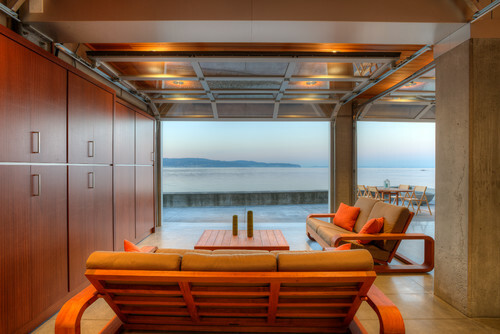 The walls of the cabana are actually industrial garage doors the architects outfitted with fasteners designed to break away under the force of strong waves. 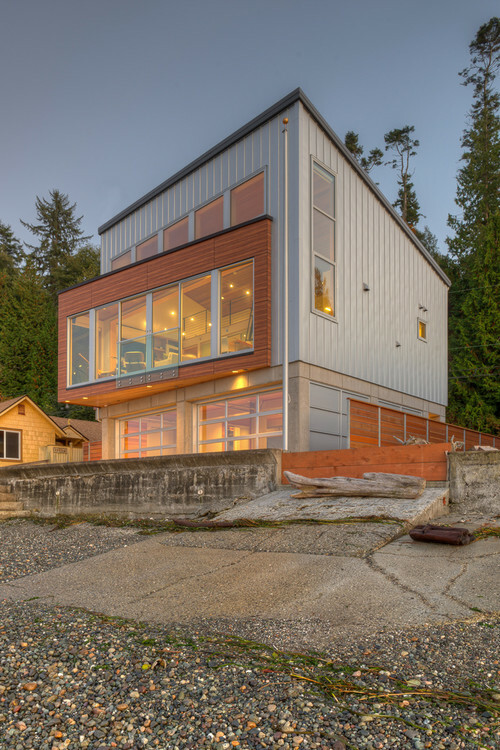 The exterior — clad in metal and Vivix siding, a Formica-like product that can look like wood — can also stand up to the elements. 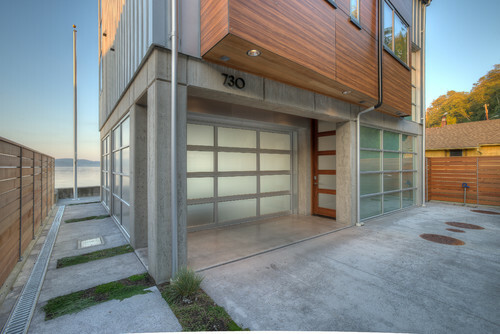 When the garage doors are raised, the path that flood waters could take is clear. For most of the year, the owners use this space as an al fresco family room. Nelson says. 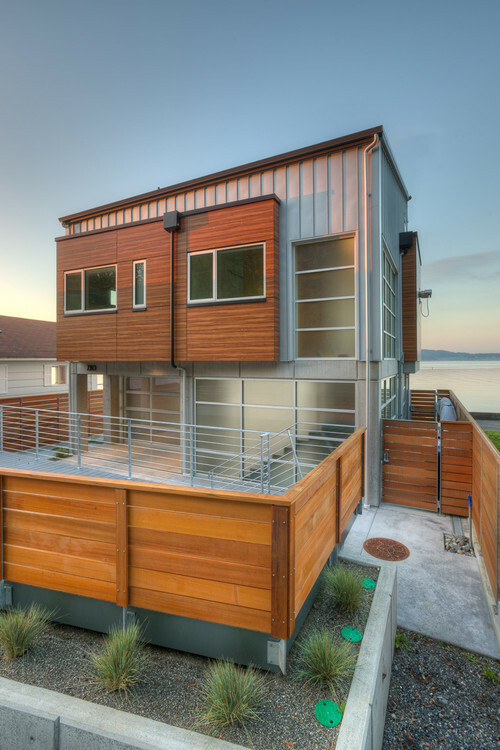 “One side opens to the beach, and the other opens to a sheltered patio." The family furnished the room simply, with sturdy furniture. Code requires all finishes and fixtures in this area to be waterproof. 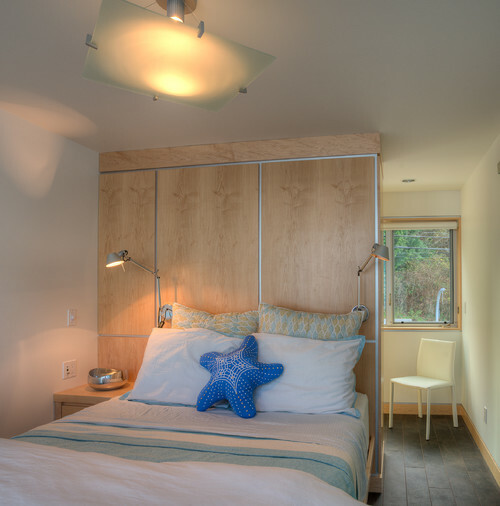 Although it’s a safety measure, Nelson notes that it’s practical for a room that’s adjacent to the beach. Futons are comfortable, are easy to move and can be extra beds. Two Murphy beds behind a wall of cabinets to the left of the seating area fold down to make more sleeping space for guests. 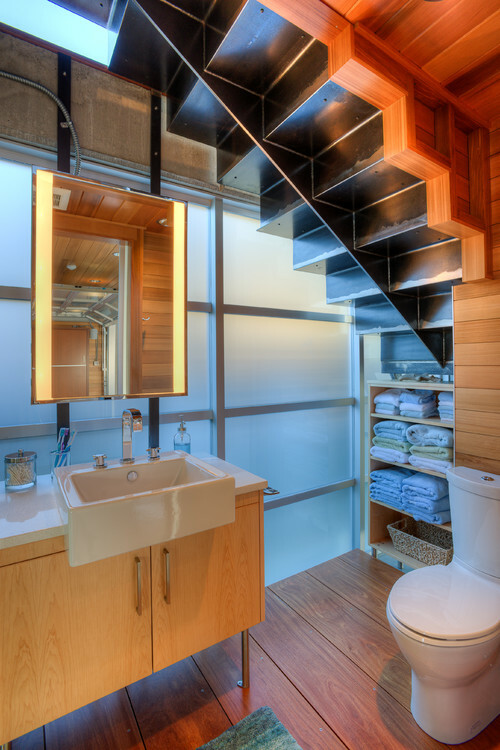 A guest bathroom is tucked under the metal stairs that lead to the family’s quarters. 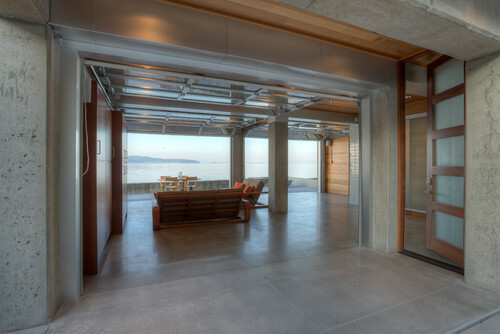 Opaque glass provides privacy while letting light from the main room flow through. 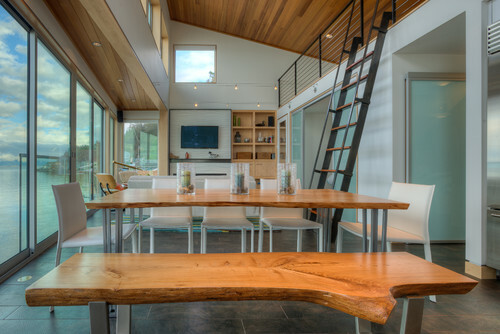 On the main floor, the kitchen, living room and dining room are located in one open space. 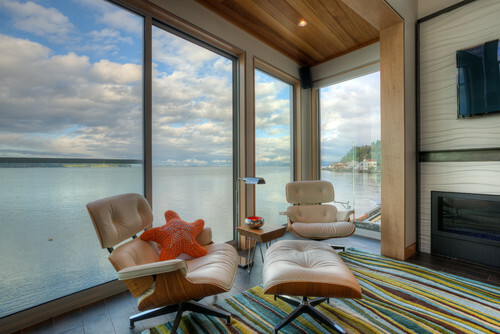 The large windows slide open to embrace a water view. Nelson says. The architect and interior designers at H2K created a subtle water motif throughout the house. 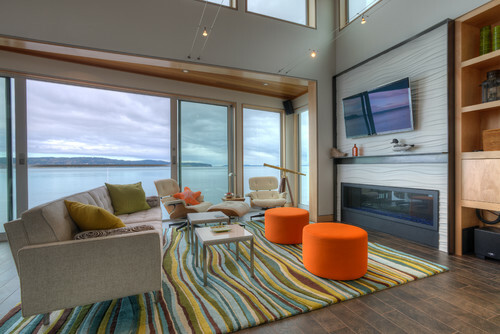 In the living room, the rug has a colorful wave pattern, which is repeated in white in the plaster panels surrounding the fireplace. There’s a bump-out in the living room. Nelson says. 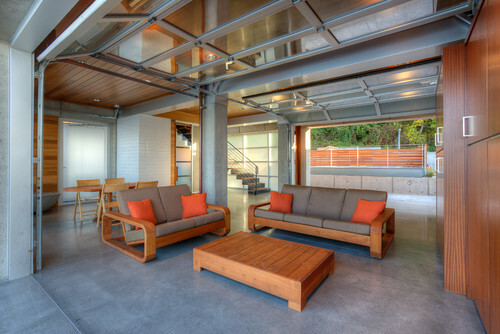 The house has many industrial elements; wood warms and softens the look. The shed roof of the new house made room for a loft, accessed by a ship’s ladder. Nelson says. 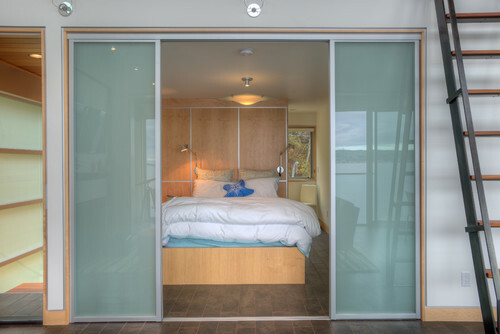 Sliding glass doors front the master bedroom. Nelson says. In the small home, economy of space is paramount. 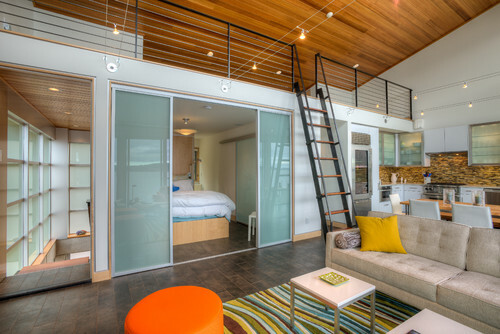 The architects tucked a closet behind the bed and detailed it to make an attractive headboard. Wall-mounted light fixtures take up no floor space. Nelson says that in the 20 years he’s been designing homes in this area, there has never been a tsunami, but that doesn’t mean one has never happened. Nelson says. COMMENTARY: Talk about building a house that can withstand a Tsunami or hurricane winds of 330 mph "just in case" of that possibility. This house must be built extremely strong. A place I would want to be if faced with just in case of just such a natural disaster. TWITTER VS FACEBOOK AD COMPARISON: WHICH OFFERS THE BEST SOCIAL MEDIA AD PLATFORM? In social advertising, where is your money better spent—on Twitter, or on Facebook? Facebook allows for some useful targeting, with a variety of expressed and implied interests available as options for targeting its users, and it has worked hard to improve its ad platform since its IPO last year. Still, although 85% of marketers polled at the beginning of 2013 by AdAge said they use Facebook as a marketing tactic, among them just 61.5% said they have used it for advertising. Facebook's Sponsored Stories ad product gets rave reviews from some, yet less than 30% have given it a shot. Twitter, on the other hand, offers a variety of "Promoted" products—Tweets, Accounts, and Trends—and worked hard at improving its self-serve platform in the year prior to its broad rollout in April 2013. Yet, again, results are mixed, and it seems Twitter still has a ways to go as an advertising platform. Network reach: Which platform reaches the largest audience? Ad performance: Do Facebook and Twitter ads drive real results? Mobile ad performance: Which social network owns the mobile space? Ad formats: Which offers the most varied and effective ad types? What I found might surprise you. Although some are so passionately behind Facebook they'd have you believe it's the best thing since TV, the truth is actually that it's doing OK. Yes, I mean just OK; it's not going to save your business, but it doesn't seem a total waste, either, as Forrester might have you believe (its analyst's recent open letter to Mark Zuckerberg claims Facebook comes dead last on a satisfaction index of digital marketing channels). There are areas in which Facebook is definitively beating out Twitter, such as Revenue per visitor. However, Twitter presents opportunities many aren't yet capitalizing on, simply because they haven't yet given it a chance. Have a look at our key findings across four measurement categories. Facebook trumps Twitter for network reach, with 1.15 billion active users to Twitter's 232 million. Although users share 500 million tweets a day, that pales in comparison with Facebook's 4.75 billion items posted daily. For sheer network size and reach, we give Facebook and A+; meanwhile, Twitter has some homework to do, and it has room to improve. Marketers are looking for that massive audience, which explains why Facebook takes 57% of social media advertising budgets while Twitter trails far behind with 13%. Actual ad performance is a tough metric to track, especially since the metrics the two networks release to the public differ. For example, we know the average CPC on Facebook is $0.50, but Twitter doesn't release that data. AdWeek tells us that engagement rates (which includes favorites, re-tweets, replies, clicks, etc.) for Twitter ads can be as high as 1-3%, which is much higher than Facebook's average CTR of 0.119%. In this respect, Twitter has already mastered the issue that Facebook has been trying to correct with its in-stream Sponsored Stories ads; Promoted Tweets are, by nature, in-stream. Advertisers will notice a significantly higher CPM on Twitter, at $3.50, compared with just $0.59 on Facebook. We can make an apples-to-apples comparison on revenue per visitor, which clearly goes to Facebook with $0.93 compared with $0.44 on Twitter. Of note, though, is that Twitter's RPV has grown exponentially year over year (YOY), with a 300% gain, while Facebook's RPV growth is much smaller at just 39%. We also found that Facebook has lost ground in share of social referred visits, with a 20% decrease YOY, bringing it to 62%. However, that still beats out Twitter's paltry 6.8% share of social visits, though it's increased 258% this year. Twitter touts its Promoted Trends product, reporting a 22% lift in brand conversion and 32% lift in retweets. They're pricey, though, and this is not a product for SMBs; at up to $200,000 a day or more, Promoted Trends are a big brand advertising tool. Facebook Ads, on the other hand, are still hit and miss with performance largely affected by vertical. The average CPC for alcohol brands, for example, is 45% higher than the average across verticals (PDF), while gaming brands enjoy a 40% lower CPC. Overall, AdAge ranks Google the most important advertising platform in terms of ROI, followed by Facebook and then Twitter. I tend to agree, as Twitter still has much to prove—especially now as a public company. Twitter has an inherent mobile advantage, because Promoted Tweets are in-stream and therefore look and feel natural for mobile users. Facebook Ads in the right rail don't even exist on mobile apps, which is a huge missed opportunity for advertisers. Facebook is blowing Twitter away in mobile ad market share, but watch for a shake-up in 2014. Analysts expect Twitter to net $1.33 billion in worldwide ad revenue by 2015, with more than 60% of that coming from mobile ads. The edge here goes to Facebook today, though it's in a perfect position to be toppled. Facebook has had to work hard at simplifying its ad offerings for marketers, and it announced big changes in June 2013, when it promised to cut the number of ad formats by more than half by the end of the year. Some analysts tend to be forgiving and they applaud Facebook's "simplification," though I tend to see it as an admission by Facebook that more than half of its ad formats simply didn't work. Ad formats on Twitter have always been simpler; it offers just three products: Promoted Tweets, Promoted Accounts, and Promoted Trends. I expect Twitter will roll out new ad formats in 2014, though if it stays true to form, there will be an extensive period of limited beta testing prior to any release. When considering tracking, analytics, and measurement, marketers are thirsty for more across both platforms. Brands still struggle with multitouch attribution and with placing an accurate dollar value on each social interaction, whether organic or ad-induced. In summary, I can't in good conscience recommend either Twitter or Facebook advertising as a good direct response (lead generation) marketing tactic. The intent just isn't there compared with search. Facebook and Twitter are great for brand awareness, content marketing, and other soft sales tactics. Use them to build relationships, educate consumers, and engage fans—if you have budget for these types of activities. Both have a lot of work to do to prove their value to advertisers. Advertisers should go into social advertising on Facebook and Twitter with clear goals, an open mind, and a willingness to pull the cord if it's just not working out. Distimo proudly presents the top performing applications for November 2013 in this blog post. We highlight the leading free, paid, and grossing apps for the Apple App Store, Google Play, and the Amazon Appstore. The charts in this blog post are based on Distimo AppIQ data, covering the full month of November 2013 on a globally aggregated level. In November, the top global free charts of the Apple App Store showed three new entries in the top five. Clumsy Ninja was first seen in early October, but the family/ adventure game “stumbled upon” the number one position, after generating more downloads than YouTube, which followed close during November. Rank number three also showed a new entry with the entertainment app Bitstrips. The app enables an interactive comic design and was also released in early October, but in November the downloads more than doubled, which caused the developer team and their servers to be positively “overwhelmed by the success”, while they are now working on making the app faster and better. Facebook remained with a stable download volume on rank four, while a newly released app from November followed close on rank five: the simulation-game My Talking Tom. While the largest portion, 27 percent, of all downloads was generated from the United States, it was interesting to see that almost 20 percent of the downloads came from China. On Google Play, the top five free apps did hardly change. The titles on rank one through three remained the same and Instagram moved one spot down from rank four to five. Rank four in contrast showed a re-entry: the Facebook Messenger app showed increased device installs by 20 percent, compared to October, and moved back up to rank four. After the United States, the most device installs were generated in India during November. In the Amazon Appstore, Candy Crush Saga held up the number one position during November. Playsino, Inc. landed on rank two with Bingo World. The classy casino game was first seen in July, but with a recent update, it came with a special Thanksgiving theme design, which might have contributed to reaching a top position in the free charts of the United States. The quiz game Guess what? HD by Blue Sky Games moved up in the charts again to rank number three, followed by a newer quiz app: Cartoons Shadow Quiz on rank four, which was released in mid-October 2013. Despicable Me: Minion Rush rounded out the top five, once again, on rank number five. Minecraft – Pocket Edition on rank one and Angry Birds Star Wars II on rank two traded places compared to October, but remained the two most successful paid apps in the Apple App Store during November. Also Plague Inc. and Heads Up! did not move from their ranks three and five, respectively. The only new name in the paid charts was Backflip Madness, which – based on our estimates – increased its download volume almost by factor 10 when compared to October. Much in line with the free charts, Google Play’s top paid titles did not move a lot during November. The global top five paid apps remained the same, while only little changes in their positions took place. Titanium Backup PRO Key ★ root was more popular than Minecraft – Pocket Edition, which moved one spot down to rank three. Nova Launcher Prime moved in a similar way up to rank four, and switched again ranks with Poweramp Full Version Unlocker, which landed on rank five in November. Unlike on Google Play, the top position remained in Mojang’s hand with the Amazon version of Minecraft – Pocket Edition. Most of the other apps in the top five paid overview of the Amazon Appstore just swapped ranks. Plants vs. Zombies (Kindle Tablet Edition) by PopCap Games, Inc. and Warner Bros’ Scribblenauts Remix both gained one rank toward the top compared to October, whereas Angry Birds Star Wars II moved down from rank two to rank five. A new addition to the top five was the (on Amazon) newly ranked adventure game Terraria on rank number four. The game was introduced by its developer 505 Games with the line: “…the sandbox adventure has finally arrived on the Amazon Store”. After the game was ranked on top positions before in the Apple App Store and on Google Play, it also scored a top position in the Amazon Appstore in the first month of its initial release. With this performance, the indie adventure game is just another example of a well performing app across multiple app stores. Looking at the top performing apps in terms of revenue, the players in the Apple App Store remained stable in November. Candy Crush Saga kept the number one rank before Clash of Clans. The number five position showed a new name though: Game of War – Fire Age entered the top five at the expense of Pet Rescue Saga, which moved one rank down to number six. Unlike in the Apple App Store, Candy Crush Saga did not hold on to the number one position during November on Google Play. The popular match-three puzzle game moved two spots down to rank three, behind パズル＆ドラゴンズ(Puzzle & Dragons) on rank two. This movement was caused by Supercell’s Clash of Clans, which claimed for the first time the number one spot in the global grossing charts, since it was released in early October on Google Play. LINE Pokopang and 몬스터 길들이기 for Kakao followed on rank four and five. Supercell’s claim of the number one grossing position for Clash of Clans in November on Google Play, is one of the main findings in the analysis of November’s Top Global Apps. Following the success of this developer, it is showing no signs of slowing, whether it is based on mobile app strategies like localization or releasing across multiple app stores, Supercell’s games are continuing to perform well in the top charts. Along with the current number two spot in the Apple App Store global grossing chart, this performance proves that Clash of Clans has longevity and appeal on both iOS and Android. The graph above displays the past six months, showing the development of the relative market shares between the Apple App Store and Google Play*. The relative market shares changed once again only slightly by one percent. Google Play increased its revenue share, growing by seven percentage points since June 2013. The revenue share of the Apple App Store decreased over the last six months from 70 percent in June to 63 percent in November. Apple is therefore still leading with the larger revenue share, but Google Play accounts now for 37 percent. The general market growth slowed down a bit during November, but we are looking forward to analyze the continued development during the upcoming holidays. * This analysis is based on comparing the revenue generated from the app stores of the following 34 countries: Australia, Austria, Belgium, Brazil, Canada, Denmark, Finland, France, Germany, Hong Kong, India, Indonesia, Ireland, Israel, Italy, Japan, Korea, Mexico, Netherlands, New Zealand, Norway, Philippines, Russia, Singapore, South Africa, Spain, Sweden, Switzerland, Taiwan, Thailand, Turkey, United Kingdom, United States, and Vietnam. These countries are chosen for this analysis, as revenue is generated for both stores in each country. For those of you interested in data about the most popular free, paid and grossing applications on a daily, weekly, monthly, or quarterly basis, Distimo’s leaderboards are a great resource for further research. These leaderboards list applications and publishers per country and per category for the Apple App Store for iPhone, the Apple App Store for iPad, Google Play and the Amazon Appstore. Combining the data from the monthly leaderboards across all countries with enriched Distimo AppIQ data allows us to analyze the most successful apps worldwide as presented in this blog post. Jim Gold has a sweater he’s worn a hundred times, and it still looks new. It’s a classic V-neck with a ribbed hem and cuffs. Most guys’ wardrobes include a couple of these pullovers, usually one in navy or gray. It’s a piece that gets a lot of wear over the fall and winter. After a year or two, the pilings get bad enough that a wife, mother or close friend replaces it with a new one in a gift-wrapped box at Christmas. Gold, who is stores division president of Dallas-based Neiman Marcus Group, says his sweater is at least 8 years old and doesn’t need replacing. The sweater is cashmere, a Brunello Cucinelli, that’s made in Italy and retails at Neiman Marcus for $645. Plenty of cashmere sweaters can be bought elsewhere for $99 or less, he said, but after you wear one four or five times, it will start to look shabby. Gold is building a case for luxury, a term he says is batted around too loosely these days. The core Neiman Marcus customer already knows that. But a broader base of customers is evolving, and some shoppers are a harder sell, said Pam Danziger, president of Unity Marketing, a Pennsylvania-based research firm that focuses on the affluent shopper. Danziger believes there’s been a shift in the makeup of the luxury consumer market. Based on her ongoing tracking study of affluent Americans, households with income levels of $100,000 to $249,999 — known as the Henrys, for high earners, not rich yet — aren’t playing as big a role in luxury spending as they did before the recession. The Henrys, an acronym coined by Fortune magazine writer Shawn Tully, are a key demographic for luxury retailers because future ultra-affluent customers usually start out as Henrys. The top 2 percent of the ultra-affluent households, with incomes above $250,000, and the top 1 percent, with annual incomes of more than $380,000, don’t have huge buying power as a group because there aren’t as many of them, she said. There are about 2.9 million in those two categories, and 1.2 million are in the 1 percent. The Henrys have big numbers, with about 21.6 million U.S. households. In late 2010 and early 2011, Danziger predicted that the post-recession U.S. market could no longer support the large number of stores that resulted from the pre-recession boom in luxury. This year and last year, Saks Fifth Avenue and Barneys New York closed multiple stores in Texas and throughout the U.S. Last summer, even Neiman Marcus closed a full-line store, its only one in Minneapolis. Another post-recession year is coming to an end. With just weeks left in the holiday shopping season, Americans, on average, now estimate they will spend $740 on Christmas gifts, according to a poll from Gallup on Thursday. That is in between consumers’ more positive October estimate of $786 and their less positive November estimate of $704. The December estimate puts the season’s increase in the range of 2.3 percent to 2.7 percent, below the industry’s estimate from the National Retail Federation of a 3.9 percent increase. That means that as a whole, Americans are operating with more of a recessionary mind-set than one inspired by the soaring stock market or recent reports of improved economic growth, Gallup said. Research and consulting firm Bain & Co. estimates that the U.S. luxury personal goods market, which doesn’t include cars, boats and travel, will grow 7 percent this year to $95 billion. Bain also forecast that worldwide holiday sales of personal luxury goods will be up a modest 2 percent, but it didn’t break out the U.S. Unity Marketing polled 1,208 affluent consumers with average household income of $267,100 in early October about expectations for future luxury spending over the next 12 months. Only 20 percent of those surveyed plan to spend more, down from 31 percent a year ago, Danziger said. While Neiman Marcus continues to cater to the wealthiest consumers, Gold said there are plenty of ways that people with lower incomes can experience the store, by buying a $25 lipstick or a $200 pair of jeans that really fit. Steven Dennis, founder of SageBerry Consulting and a former Neiman Marcus senior vice president, said there’s more complexity to the luxury consumer than retailers like to talk about. By the way, here's the Neiman Marcus Christmas Book for 2013. COMMENTARY: According to research from the private wealth division of Citibank, the average shopper at Neiman Marcus has household income of $250,000 per annum. The average Nordstrom customer, in contrast, earns $100,000 each year. That means the average Neiman Marcus customer earns roughly $20,834 before taxes and, with standard deductions, probably $15,000 in take-home pay each month. The average Nordstrom customer, in contrast, earns $100,000 each year, or $8,334 gross per month, which results in $6,000 net after tax deductions and payments. Both shoppers are considerably higher than the $50,000 annually earned by the average American household and the $35,000 earned by the average Wal-Mart shopper. Put another way, if you shop at Nordstrom you likely earn 2x the average American family and if you shop at Neiman Marcus, you likely earn 5x the average American family. If you are a doctor, an attorney, a wealthy business owner, or a bank president, your wardrobe is incredibly important. It instantly conveys to prospective clients that you are successful and good at what you do. It is a symbol that instantly communicates without words. Furthermore, your wardrobe is going to last probably an average of 3-5 years rolling. That means that you could amortize the cost in accounting terms. If you compare Neman Marcus and Whole Foods customers, you will find some similarities and some succinct differences between them. Beyoncé’s surprise album launch last week says so much about the changing media landscape that it’s kind of hard to know where to start. But one thing that stands out to me is the way social media has enabled the music business to revive a business model that looked increasingly moribund: whole album sales. According to Billboard, Beyoncé’s self-titled album, which is only available for download in its entirety, sold 450,000 units within 24 hours of its release on iTunes Friday night, and close to 850,000 by the end of the weekend, putting it on course to sell one million copies by Monday evening. At $15.99 per album, that makes a tidy sum indeed. Fans will be able to buy individual tracks beginning December 20. Naturally the unusual approach to launching the album has elicited a great deal of comment: Beyoncé and Columbia dispensed with the usual months-long promotional blitz, with its tired routine of TV appearances, releasing singles, heavy radio rotation, and all that. Instead she just announced the album on Instagram with the single word “Surprise!” and counted on social media to do the rest. Of course this generated plenty of coverage on news Web sites, blogs, and then more “traditional” media like broadcast radio and TV (she also graced fans with a live performance of future single “XO”). The album itself is very au courant: a complete multimedia product, it includes videos for every song and four bonus videos, making it a “visual album.” But there’s a pleasant irony in the fact that all this digital media innovation is focused on selling a complete album with 14 songs, all (presumably) forming one coherent artistic statement; why, it could be 1973 again. Seriously, I can’t remember the last time I bought a whole album. Sure, people of a certain age still venerate and celebrate the great albums of the past: the 35th anniversary edition of Fleetwood Mac’s “Rumors” generated quite a bit of buzz (and probably a good number of tokes) earlier this year. But more recently it seemed that, in our world of on-demand media consumption, where we are dismayed to find our attention spans challenged by Vine, the album was a thing of the past. The numbers certainly seemed to suggest as much: from 2004 to 2012, total album sales fell 53% from 667 million to 316 million, according to Nielsen SoundScan and Nielsen BDS, even as total music sales (including singles, music videos, and so on) rose from around 820 million units to 1.66 billion units over the same period. There’s no question that Beyoncé is atypical: first and foremost, she is Beyoncé, and this, in combination with other factors -- the novelty of the surprise album, a holiday season debut -- probably combined to make her release a success where others might have flopped. But if a million fans are willing to shell out $15.99 for a whole album, rather than waiting six days for individual tracks, maybe there’s life in the long form after all. COMMENTARY: Beyonce explained on her Facebook page that Beyonce is a “visual album,” and that she “sees music.” We’re glad she does, because the videos onBeyonce are awe-inspiring. Here are a few images taken from the 14 sounds included in her Beyonce album. WHETHER YOU ARE MAKING A WEARABLE OR HOME AUTOMATION DEVICE, THESE ARE THE THINGS TO THINK ABOUT BEFORE PITCHING YOUR IDEA. Renee DiResta invests in connected hardware. She's a venture capitalist with O’Reilly AlphaTech Ventures, which has helped fund companies including LittleBits and Misfit Wearables (see below videos). She is also organizing a conference called “Solid” which is all about the future of manufacturing, with a focus on the industrial Internet of things. During a recent event at Smart Design, we asked DiResta to talk about what it takes to "win" in the connected device space. Here's what she said. “One of the things I see frequently do is Arduino-style projects that grow organically out of the maker ethos being pushed into the mainstream market before a lot of thought has gone into what the market segmentation’s going to look like, what the user is really going to need, and to what extent you can make the product intuitive out of the box. I myself have received Kickstarter projects where I’ve taken it out, plugged it in and said ‘I can’t make this connect to the Internet. I have a computer science degree, and I have no idea what I’m doing wrong.’"
Keep in mind that companies like Apple have set the bar incredibly high. Consumers are now accustomed to taking a gadget out of its box, pushing one button, and having everything just work. “I was asked to do some advising at two of the hardware accelerators around here. One of the things we see very commonly is people will believe that they have an idea and then the Kickstarter will take off and they’ll find themselves unable to handle fulfillment or come up with an accurate timeline. A lot of the mistakes I see as a seed stage investor are the mistakes of just naivety. Not making a thing that can be made. Here’s this beautiful design, but where the rubber meets the road it’s simply not possible to have a bill of materials come in at a price you need to see." The easiest way to overcome that problem: Find a mentor, and invest the time in doing real research on the manufacturing process. She says. “Misfit Wearables is one of our portfolio companies. They did the Shine. They actually raised money prior to launching on Indiegogo. The Indiegogo launch was partially for marketing purposes. Indiegogo was selected in part because they offer flexible perks. And the really interesting thing about flexible perks is that you can adjust your customer offerings in real time. So you can put out like ‘Hey, we’re going to offer 50 black Shines and see how quickly those turn over. Or people started writing in to them and saying ‘Hey, I’d really like my Shine to connect as a necklace.’ What Misfit was able to do is say we’re going to use this as a channel to reach our early adopter customers and really get a sense of what they want. They had already designed it. It was already made. There was already the core design of the Shine which was made in Korea, Vietnam, and the U.S.--it was a fairly complex process that went into manufacturing that device--they were able to take that and then say, ‘What do we need for our go to market strategy?’"
Misfit was able to do that in part because they had already raised funding. One area that startups constantly get wrong is marketing and branding, says DiResta. The connected device space is full of potential, but it's often at odds with entrenched consumer behaviors. That's got to change. DiResta says. It’s better to roll out a version 1.0 that’s simple and let the product evolve over time. She says. So how do you know when your connected device is ready for market, or at least an investor pitch? DiResta says. COMMENTARY: If you are an entrepreneur or startup with a great new technology product, I highly urge that you read "The Innovation Secrets of Steve Jobs" by Carmine Gallo before you launch your product or begin prototyping your product. I mentioned these innovation secrets in my blog post dated October 6, 2011. I also highly recommend that you learn how to properly pitch your idea to investors by viewing Dave McClure's "How To Pitch A VC" slide show (See above). Mercedes-Benz unveiled its wild Gran Turismo Concept at the 2013 Los Angeles Auto Show. This is the automaker's vision of motoring in the future, and it's a vision we can get behind. Unfortunately, the Gran Turismo Concept is just that--a concept vehicle that won't be built, well, ever. At least not by Mercedes-Benz directly. However, it appears that some enterprising fabricators are looking to produce the Gran Turismo Concept, and it could be in your garage if you're ready to fork over $1.5 million. Per the listing on JamesEdition, the car will be built using the 2014 Mercedes-Benz SLS AMG GT as the base vehicle . From there, the body will be formed using carbon fiber and ADV.1 will create wheels to mimic the look of those found on the concept vehicle. A carbon-fiber body will help reduce the weight of the SLS AMG GT, and the listing says customers can specify custom changes to the interior of the vehicle. Just five will be created, and one is already under contract. The listing states that two will go to Europe, two will wind up in the Middle East, and the final car will make its way to the United States. We're extremely curious to see how this project turns out. If it winds up looking like the Gran Turismo Concept then we may just declare that this is money well spent. Well... once you juice up the power a bit to match the wild looks. COMMENTARY: The MB AMG Vision GT is a brute of a car. Love the wide body, exaggerated fenders and huge tires and rims on this car. The body style reminds one of the Corvette Stingray on steroids. Looks like Mercedes-Benz is finally adopting the "muscle car" look that has been a strong point of differentiation for Cadillac.